This whitepaper is co-authored by Shane Brett, Managing Director at Global Perspectives, an Asset Management and Hedge Fund consultancy and Alan Meaney, Director at Fund Recs, a specialist software provider to the Funds Industry. During the past six months Shane and Alan have held discussions with 30+ depositary firms around their plans for implementing AIFMD and how their framework for day to day activities might look. This paper covers AIFMD from the perspective of a depositary and discusses some of the practicalities in setting up an operating model in order to comply with the directive on a day to day basis. The information contained in this whitepaper is general in nature and should not be taken as specific advice for any one depository. AIFMD requires the depositary to take on strict liability for loss of assets held in custody and even if this responsibility is discharged there is still substantial risk to the depositary. Therefore, it is imperative that any firm looking for guidance on this matter seeks advice from their local legal counsel when finalising their model. The aim of this whitepaper is to provide a useful starting point to generate some of the internal debate and questions when transitioning from discussing the Directive to implementing processes and procedures around its compliance. This is intended to be a working whitepaper and we plan to update it as new information on depositary operating models becomes available. We hope you find this paper useful and appreciate any feedback you might have. The role of the depositary breaks down into three areas defined under Article 21(7), (8), and (9) of the Directive; the safekeeping of assets held in custody; monitoring of cash flows and an oversight role. Only EU AIFM managing EU AIF’s are subject to the full depositary regime (Article 21), whereby a single depositary is required to perform the three core depositary duties of safe keeping of assets, cash flow monitoring and oversight. Under this model, the depositary is required to take on strict liability for loss of financial instruments. However, a depositary may delegate the safekeeping of assets to sub-custodians, but may not delegate the cash monitoring or oversight duties. 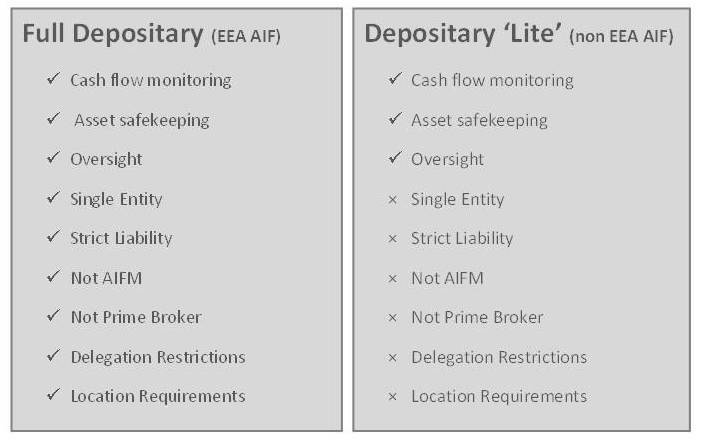 “Depositary lite” is the term used to describe the obligations of a depositary appointed to a non-EU AIF managed by an EU AIFM which markets in Europe under a private placement regime under Article 36 of the Directive. The obligations of a depositary lite are similar to those applied to a full depositary with a few key differences. The liability standard for the loss of the AIF’s assets in custody is negligence rather than the strict liability standard. It is possible for different entities to undertake the different depositary lite tasks; therefore, a prime broker could be responsible for safekeeping (assuming it had segregated the depositary function from the prime broker one), an administrator for cash monitoring and a supervising entity for oversight. 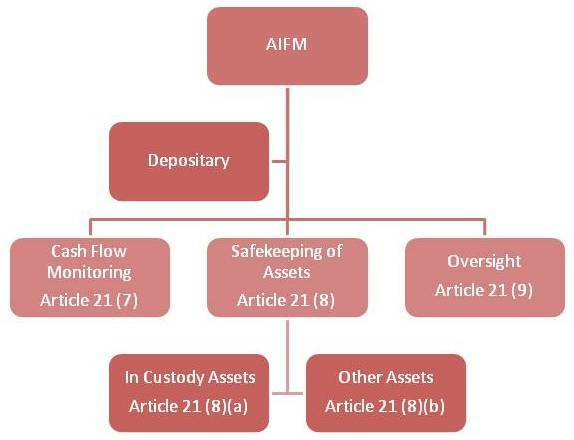 Under AIFMD the depositary remains liable for the loss of any of the AIF’s assets held in custody unless it can prove that the loss has arisen as a result of an external event beyond its reasonable control, the consequences of which would have been unavoidable despite all reasonable efforts to the contrary. This effectively makes the depositary strictly liable for the loss of assets in custody, which is a significantly higher standard than the one depositary firms are used to. The pre-AIFMD standard of liability contractually assumed by depositaries did not extend to loss of assets by their agents or sub-custodians, except where they breached their legal standard of care in the selection, appointment and monitoring of such agents or sub-custodians. This contrasts to the AIFMD position where, in the absence of force majeure events, a discharge of liability, or a safe harbour for assets held through a central securities depositary, a depositary is strictly liable for loss of assets in custody by any party beneath them in the chain of custody. This includes all sub-custodial agents and prime brokers (and their own independent sub-custody networks). We will look at each of these requirements in turn, as well as identifying some of the key considerations for depositaries in developing their operational model. Under the AIFMD the depositary must maintain either custody or recordkeeping for all the assets on the fund. 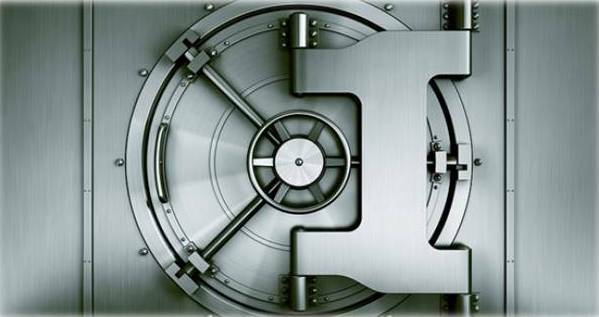 The depositary is required to monitor the custody risk throughout the chain of custody on an on-going basis. All assets of the fund which cannot be held in custody by virtue of their nature (e.g. investments in other Collective Investment Schemes) must be recorded and monitored by the depositary. The assets of the fund must be separated from the assets of the depositary in such a way that they can be clearly identified as belonging to the fund at all times. There is still some debate regarding the level of segregation required under AIFMD. Many depositaries feel it is extremely difficult to implement the segregation requirements of AIFMD in practice. We would recommend a “best efforts” basis be put in place for all funds and their assets. Implementing this separation of assets is likely to increase the cost of the depositaries operational model, as they put in place the required financial, operational and technological enhancements required to comply with the segregation rules. It is still unclear how many national regulators view managing conflicts of interest – where the same large organisation could be providing depositary, custody and administration services (“One-Stop Shop” model) to an AIFM. Depositaries would be advised to ensure their depositary model is developed as a clearly separate function with its own processes, controls and reconciliation functions. Depositaries need to consider how they will best mitigate risk in their operating model if one of their prime brokers proves unable to perform the custody function on behalf of the fund (for example in the return of the funds’ assets). 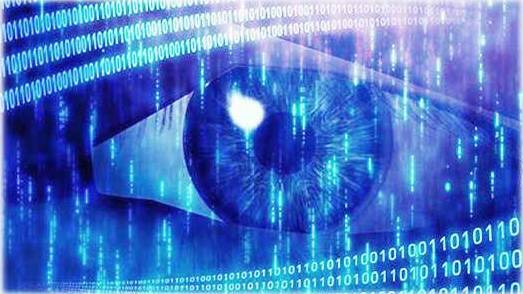 Enhanced and on-going prime broker monitoring and due diligence will be required. In completing their prime broker due diligence depositaries need to ensure they are comfortable with the operational model and controls the prime broker has in place. Where these models do not match the depositaries risk profile, the depositary may not wish to have the prime broker appointed. This could lead to a conflict with the fund manager and their investment strategy. Operationally depositaries need to consider carefully how prime brokers and sub-custody delegates outside the EU will be managed. Local laws (for example in the US) could be different (or even conflict) with the requirements of European regulation. Under the AIFMD the depositary must maintain oversight of the Fund. o Ensuring that the NAV is calculated in accordance with the rules of the fund and the valuation principles within the AIFMD. o Ensuring that all transactions involving the AIF’s assets, any consideration is remitted to the AIF within the usual time limits. The depositary must also monitor the investments of the fund to ensure they are in accordance with its stated investment restrictions. The depositary must maintain accurate records in relation to all its oversight responsibilities. The depositary cannot delegate any of these oversight responsibilities to a third party. The depositary should be aiming to “plug-in” to the existing service providers on the fund. However depositaries will be heavily dependent on reports and data feeds from the fund accounting, valuation and transfer agency departments of the fund’s administrator. These linkages will need to be carefully controlled and fully tested. In cases where the administration of the fund is done by a third party, additional resources will be required to build and test the protocols and controls put in place to ensure the depositary can access the fund data it needs to execute its oversight requirements on a timely basis. Under the depositary-lite model it is likely to be Prime Brokers who will typically perform the safe keeping of the funds’ assets. This means depositaries have to move to establish data and reporting linkages between these third party firms and the depositaries own systems. Substantial operational training will be required at most depositaries, as well as the introduction of new controls and systems, as depositaries seek to interpret the practical implementation of the AIFMD rules. AIFMD requires that the depositary monitor the AIF’s cash accounts and completes a reconciliation of the AIF’s cash flows. The depositary has a responsibility to put in place effective procedures to reconcile all the movements of cash on the fund on a daily basis (or as so often as they occur in a more illiquid fund). This includes implementing and completing a full reconciliation and overview of the funds cash positions and cash movements, including subscription, redemptions, income etc. The depositary must be able to identify any unusual or unexplained cash flows at the close of each day. Where discrepancies are identified and are not resolved without undue delay, the depositary must immediately move to notify the AIFM. The depositary must be able to reconcile its own records with that of the AIFM. It is important to note that unreconciled fund accounting cash transaction reports will not provide sufficient comfort as to a true reflection of the actual underlying cash transactions on the fund. Using data from the broker/custodian side for cash flow monitoring is a prudent approach. For different AIF’s the definition of ‘unusual or unexplained cash flows’ will vary. 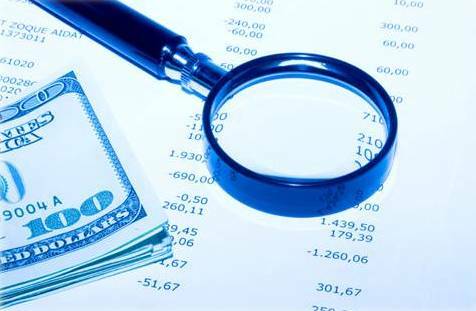 Therefore it is difficult to establish a single set of rules for cash flow monitoring that can be applied to all funds. One approach is to agree applicable rules in advance on a fund by fund basis with each AIFM. Although this adds additional complexity there seems to be no alternative. Procedures for dealing with cash exceptions must be established and signed off with each AIFM. The time to document these is now and not when a breach occurs. As can be seen from this white paper the development and implementation of a comprehensive depositary model involves many important operational considerations. The end of the transition period for AIFMD implementation increases the urgency for which these issues must be analysed and addressed. Depositaries would be well advised to seek expert independent guidance regarding the rollout and implementation of their depositary models, as depositaries adopt these new functions and the industry moves to a new standard. In implementing their new operational model depositaries will require a comprehensive suite of software to enable them to properly execute their safekeeping, oversight and cash-flow monitoring obligations. Shane Brett is a consultant, author and thought-leader specialising in hedge funds, asset management and the wider global economy. He has worked in the Alternative Investment and Financial Services industry for 18 years and has managed large operational teams for hedge funds and their administrators including UBS and BNP Paribas. Shane is the author of two books – “The Future of Hedge Funds” (2012) & “The AIFMD Cheat Sheet” (2013). Alan Meaney brings over 9 years’ experience in the Fund Administration Industry including from HSBC and SEI Investments. Alan founded Fund Recs in 2013 to provide cloud based reconciliation software for the Funds Industry. Recently it launched its Depositary Rec product which helps depositaries scale their services.